ISMPP is the only not-for-profit professional organization dedicated to supporting medical publication professionals. ISMPP operates as a 501(c)(6) organization under a carefully drafted constitution, registered in the State of New Jersey, USA, and recognized by the US Internal Revenue Service as such. Our not-for-profit status distinguishes us from all other groups, ensuring that all income realized is filtered back into the membership, as well as used to further the profession. This was “mission-critical” for all of ISMPP’s founders. ISMPP now has more than 1,500 members representing all sectors of medical publishing from the pharmaceutical, biotech, and device industries, medical publications and communications agencies, journal publishers and editors, professional medical writers, academic researchers, and other allied professionals. We are truly international, with members from around the world. Our membership is our strength, and dedicated volunteers run our committees. World-class conferences including European Meeting (250 attendees), Annual Meeting (500 attendees), Asia Pacific Meetings and events. The ISMPP U Committee offers member-only web-based seminars on a wide range of topics presented by leaders in the field. Programs are offered nearly every month, some of which qualify for CMPP™ Recertification Credits. Every January, ISMPP offers a complimentary 90-minute ISMPP U that is open to the public. Check it out! Accessible via the members-only portal, the Archive features recordings of all ISMPP U events, as well as a wide range of slide decks and other materials from previous annual meetings or other programs. Help to shape the leadership of this evolving field through active participation on one of the many ISMPP volunteer committees. Created just for members, the ISMPP Tool Box is an initiative to provide practical resources to support members in a variety of areas, including the newly launched ISMPP Standards Handbook. Upcoming resources include an updated publications glossary and additional modules added to the Handbook. Network with a wide range of leaders in this exciting field. Whether an employer or a job-seeker, this monthly job board presents a unique resource to find new talent or to search for your next opportunity. Special pricing is extended to all ISMPP members. 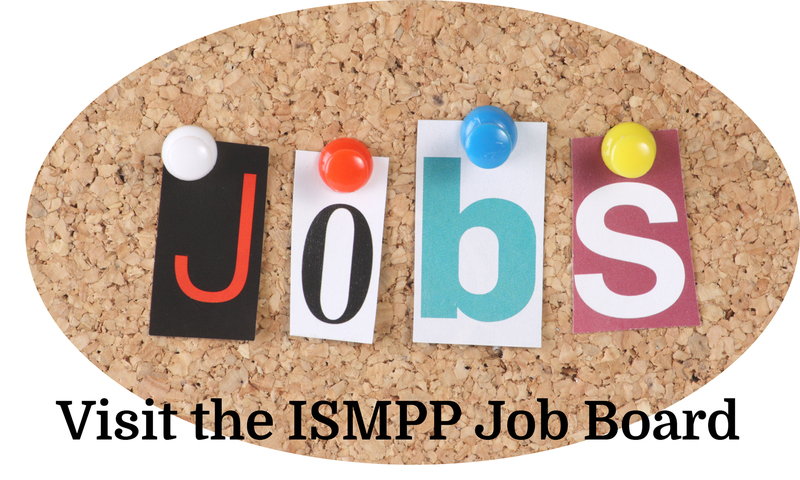 To learn more about the ISMPP Job Board, click here. ISMPP offers a social media environment open to society members. Share insights, organizational news, accolades, and other professionally relevant information with your colleagues in a closed environment. ISMPP is on Twitter, LinkedIn, Facebook and YouTube. View our member-driven survey policy.